High power 12 volt to 24 volt DC/DC converters at low cost. Suitable for voltage stabilization of automobile electronics, PLCs, special purpose UPS, etc. 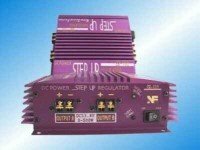 These DC/DC converters closely regulate the output voltage over a range of input voltages. *The two sets of output terminals on this unit are connected together, you can draw all the power from one or the other. There are two sets of terminals for convenience in case you want to run more than one piece of equipment. Also can be used to provide regulated 24 volts from a sealed lead acid battery--excellent for special purpose UPS DC battery backups.